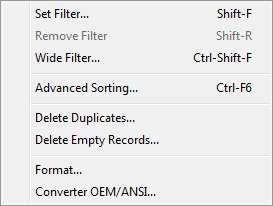 Displays Filter dialog (Query by example) for filter records. After filter done you see only records for that's filter expressions is true. Convert records to ANSI or OEM code page. Sorts forwards, i.e. A to Z, the smallest to the largest, oldest to youngest. Sorts backwards, i.e. Z to A, the largest to the smallest, youngest to oldest.